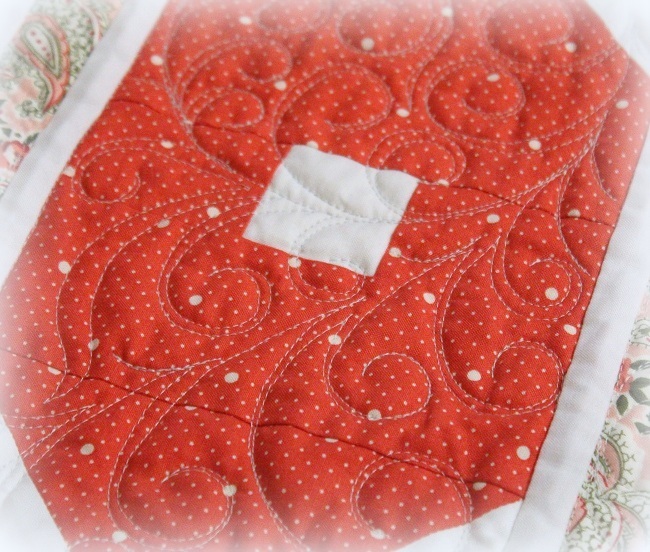 This entry was posted in Quilting, Thread Talk and tagged Feather quilting, Free-motion quilting tips, Wendy Sheppard. Bookmark the permalink. I think that your middle name is “Energizer” as you just keep on going and going and going. I find it amazing how our quilts “speak” to us. You might think one idea is the way to go but then a nagging feeling begins to tug, telling you that something is just not quite right. Seems as though it is these little changes that take so much more time. However, in the end, the change is usually for the best. I am excited to see what you have done. Red and polka dots……it has got to be spectacular!! Neat way to adapt to and enhance the design! I love these little free and happy plumes!